Tell the decision-makers today that the plan must be substantially changed or rejected. If New Yorkers speak up, we can achieve a better plan for New York. Not having seen the actual principles, Forest City Ratner spokesman Joe DePlasco likely was too welcoming, telling the Times that the developer was “pleased to see that these groups want to talk about ways" to improve the project. Does FCR really want to see the project cut in half--a potential change not mentioned in the Times article? In my piece reacting to the Times article, I gave too much weight to the Times's description that the effort was "focusing on mitigating the project’s impact rather than blocking it altogether." That's not untrue, as BrooklynSpeaks takes no position against eminent domain, but the posture is tougher than both the Times and I allowed. BrooklynSpeaks represents a split in the opposition (though several BrooklynSpeaks members could be characterized as "concerned" rather than opponents), an assumption--as I wrote--that pragmatic pressure is a wiser tactic than outright opposition and an all-or-nothing legal fight. Will it acquire more of a critical mass? It currently includes nine civic groups, seven from Brooklyn. Five of the groups are members of the Council of Brooklyn Neighborhoods (CBN), which was formed to respond to the Draft Environmental Impact Statement. CBN has 35 members, ten of them block associations. A reduction of one third in the total amount of sf, as proposed by State Assembly Members James Brennan and others, to cap the development to a maximum of approximately 5.8M sf. This density would create development roughly comparable to the density permitted in parts of Downtown Brooklyn. A reduction of one half of the total amount of sf, to cap the development to a maximum of approximately 4.3M sf. This would create a development roughly equivalent in density to Battery Park City in Manhattan, which has 152 units per acre. The Atlantic Yards plan would contain more than twice as many per acre if built as currently proposed. Does that mean that the ultimate compromise would be somewhere between one-half and one-third? Note that Downtown Brooklyn was rezoned for office space, not housing--though most new construction is housing--and that even 5.8M sf would be a significantly dense development. I've suggested that a 50 percent cut should be a ceiling for discussion. 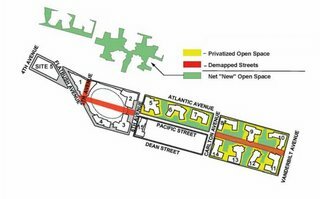 BrooklynSpeaks calls for the creation of new streets to extend the street grid from Fort Greene and criticizes the creation of superblocks, calling for Fifth Avenue to be left open, which would shift the planned arena to the east. But that the criticism is selective; Pacific Street should not be demapped east of Carlton Avenue, but the demapping of Pacific between Fifth and Sixth avenues to create the arena superblock is accepted. --begin congestion pricing, as has been successful in London. However, two thirds of the units in the development will be sold or rented at market rate, and 60% of the affordable units would only be affordable to families making in excess of the Brooklyn median income, which is $35,000 annually. Also, despite the fact that the proposed project will displace families earning less than $21,000 annually, none of the affordable units currently proposed are affordable to those families. --the potential creation of affordable homeownership opportunites on-site, rather than elsewhere. The latter, however, would increase the project density. And it's unclear how the affordable housing would be financed. We don't know even now the sum of the subsidies for affordable housing. While an increased reach to accommodate poorer New Yorkers would demand more subsidies, the public shouldn't be asked to pay unless there's a clearer accounting of the project's costs and benefits--an issue not raised in BrooklynSpeaks. Michelle de la Uz of the FAC told me that, even putting affordable housing aside, the profit and loss statements are an important element of transparency. Where could the money come from? Battery Park City has produced $130 million in revenue geared to hard to reach populations, she said. The Atlantic Yards proposal was conceived by the developer and the political decision-makers behind closed doors and has moved forward with no significant input from New Yorkers. No Brooklyn official will get to vote on the project. Redesign the project with public input. Create a subsidiary with local representation to manage future decision-making and an ongoing public process for the site. While that certainly would be an improvement, it accepts--likely for political reasons--the project as it has arrived, with a single developer gaining backing for a project including the MTA's valuable Vanderbilt Yards 18 months before the agency put the railyard out for bid. That legitimacy issue surely will be part of the inevitable lawsuit filed by Develop Don't Destroy Brooklyn (DDDB) over the eminent domain case. As noted, some groups endorsing Brooklyn Speaks are essentially repudiating some of the principles for responsible development for the Vanderbilt Yard that they endorsed, including no use of eminent domain and a project evaluated via the city's more stringent land use process, not the state's fast track. as well as other issues. That's a nod to the hugely-charged issue of eminent domain, which distinguishes this group from some other civic groups and the DDDB coalition, which does not accept the use of eminent domain to aid a private developer to build an arena. So far the Fort Greene Association and the Society for Clinton Hill, among others, have not signed on to BrooklynSpeaks. The sponsors of BrooklynSpeaks call the public process "deeply troubling" and the proposal "deeply flawed." The strong implication is that Forest City Ratner, in its plans for the project, and the Empire State Development Corporation (ESDC), in its environmental review, have failed in their public responsibility. One lingering question: must all the changes sought be implemented to gain the support of BrooklynSpeaks? Would the coalition accept transportation improvements, a reconfiguration of the project, and increased housing for lower-income Brooklynites without a substantial cut in the density? To see the letters, you have to log in and check a box saying you support the BrooklynSpeaks principles; if you don't, you're stymied. As of last night, 695 people were listed as signing on to the principles. That didn't actually represent the number of people who logged on in just a few hours; rather, it included hundreds of people who had already endorsed the MAS principles regarding the plan. Meanwhile, the Sept. 29 deadline for comments on the DEIS approaches; expect some detailed and tough critiques from the Council of Brooklyn Neighborhoods. While some of the critiques may buttress the general posture of BrooklynSpeaks, others may point to broader issues regarding the process and the project.